That pictures reminds me of strata along the Colorado river. Well ya didn't specify an application, Tom. I hope that wasn't your water system Martin! Just one of my clients on the Mississippi River with a really old water system. They have all kinds of problems they are dealing with. They have a lot of old cast iron pipes that are prone to failing in this cold weather. They had a 1.5 MGD leak last week that it took several days to find. What do you think are the relative merits between butterfly and ball valves? I figure the butterfly valve is easier to clean, but the ball is less likely to get clogged. Anything I'm missing? How about this for a clog? 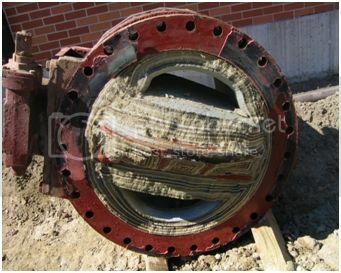 That is a 24" butterfly valve that was located just downstream of a sodium hydroxide injection point in a water system. The NaOH was added to control corrosion potential in the distribution system. Unfortunately, the caustic did not mix well in the pipe and it precipitated the deposits in the pipe and on this valve. I would expect that the deposits were calcium carbonate (chalk), but the high OH concentrations actually caused calcium hydroxide (lime) to deposit instead. This isn't really applicable to this discussion, but I figured some might enjoy the mysteries of water chemistry (when done wrong). that's when you call something art and sell it for some more brewing equipment. A 1000gpm leak took them days to find? 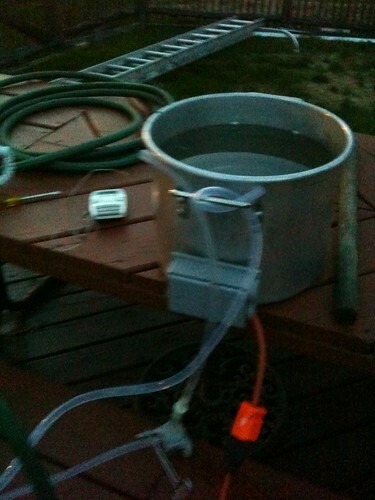 A valve was that scaled up and they didn't notice a drop in flow? Sounds like their biggest problem is their operators. They had a 1.5 MGD leak last week that it took several days to find. ASounds like their biggest problem is their operators.